April came to the Real Estate field in 2006 after a long and rewarding career in Special Education. She resides in Valley Head with her husband Kirk and "Riley", their Great Dane. April and Kirk have one daughter, Kristen, who graduated from the University of Alabama. April enjoys spending time with her family, reading, golfing, scrapbooking, traveling, going to the beach and meeting new people through her Real Estate career. Why choose April as your Realtor? 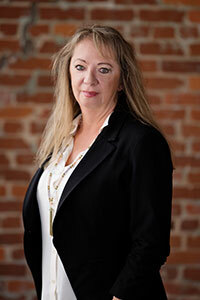 She will really listen to you and will work tirelessly on your behalf to successfully meet your real estate needs. If you are a buyer, April will listen carefully to you and show property that matches your wishes. Sellers are pleased with the marketing strategies April uses to expose your property to the widest possible range of qualified buyers. So CALL APRIL where service is not a department but an ATTITUDE!